Altiplano—or, as it is affectionately known ’round these parts, “the llama game”—displays a hobby in rude creative health. As you’d expect from noted German designer Reiner Stockhausen, the game is a formidable packet of innovative interlocking systems, confidently presented, and (once you wrap your head around the strategy) a tough but engrossing mental challenge. This might look, on the surface, like a game for kids. Its mascot is, after all a goofy, boggle-eyed llama alpaca (llama?) with a pronounced underbite; the animal also appears as an elaborate in-game standee denoting the first player. The bold colors and vibrant illustrations, however, belie a game of real depth and complexity—perhaps a bit too much complexity for some. Altiplano is a sequel of sorts, at least in terms of mechanics, to Orléans, Stockhausen’s 2014 game of “bag building.” The idea: what if we did a deckbuilding game, but with tokens in a bag? At the time, this wasn’t exactly a new idea, but Orléans did help popularize the genre. In practice, it means that you start with a few basic workers, represented by tokens, who can perform certain basic tasks, and you exploit their labor to get better workers of different colors who can team up to form more complex tasks, like building a cathedral or taking a nice trip around a washed-out map of central France. Along the way, your trusty workers gather the key currency of this exotic land, “les points de victoire.” Your workers all live in a cloth bag and emerge from it at random, much as they would in the deck of cards the design so cleverly replaces. This time around, we visit an Andean settlement, a much fruitier theme than the absolutely arid high middle ages of Orléans, which could sometimes feel like playing with an abacus. The color saturation has been turned up to 11—and with it the charm factor. Everything is now a vivid orange or a deep green, and the illustrations no longer resemble the cover of your least favorite high-school history textbook. If nothing else, the visuals make the game easier to get to the table; people intrinsically gravitate to Altiplano’s boldness. That said, I’m not convinced that the newer game is better. Orléans, for all its visual arrested development, is a remarkably tight and interesting game. Altiplano, on the other hand, feels like Stockhausen has tried to crowbar every idea he’s ever had into the thing. What emerges isn’t bad… it’s just heavy enough to be occasionally brain-breaking. Know what you’re getting into here, and don’t let the joyousness of the art confuse you. Despite the fact that it doesn’t have a big square central board, it takes up an enormous amount of table space for something that professes to play in two hours (realistically, three, in my experience). Everyone starts with a personal player mat, which is already dense with information that’s hard to parse for new players. Alongside this personal board, there’s also a little box and another mat that represents a storehouse. In the middle of the table, there are seven further boards, representing locations one’s Andean worker meeples will visit on their journey to becoming chief alpaca wrangler or whatever the goal is (the manual is vague). Atop these boards go huge piles of resources (a massive 12 varieties in total, for several hundred disks in all). Your meeples spend the game wandering the Andes, moving from village to market to lake to mountains, collecting resources by investing other, weaker resources—i.e., to get a fish, you spend food to feed the fisherman. Everyone starts with one unique special ability, a small handful of basic resources, and a great big frown at the mental activity required just to get started. In its most basic form, the game makes sense. The turns themselves are simple: you pick new resources out of your bag and then apportion them to various action spaces on your player board that correspond with the locations. Then everyone takes an action in turn, transmuting food into stone or cacao into glass jugs. You can visit the market and sell goods to make money to buy contracts which you fulfil for points, and there are higher tiers of more complex actions that get you more points as you go through the game. You can buy new action spaces that let you take unique actions to swap goods for types that other players can’t get, and you can buy canoes and huts that provide resources or point multipliers. There’s also a whole storehouse mechanic that lets you ditch your crappy or unneeded resources to get bonus points at the end of the game. The goofy, slack-jawed alpaca who mascots the game. Starting player tiles—it’s nice to see a vibrant game that doesn’t theme itself after one aspect of medieval history or another. The publishers are extremely, mercifully generous with the baggies. The player boards (and additions) are festooned with arcane Eurogame symbology. The main boards sit in the middle of the table, along with a whole mess of tokens. …and another whole storehouse board just to contain chit overspill! The manual explains just how much is going on, though the translation is awkward in places. Did we mention the four decks of cards? Huts and canoes mean points, as do the order cards to the bottom right. The last set is a collection of secret missions that adds yet more complexity to the mix. Just a selection of the extra moves you can buy. There are a lot of mechanisms in Altiplano, not all of them great. For instance, there’s a movement mechanic here that Orléans lacked, and which feels like the most needless innovation in Altiplano. Every one of the actions you prepare on your player board and the extensions you buy as the game moves along corresponds to one of the seven locations. To take that action, your colorful wooden dude has to be physically in that location, but you only get one free move of up to three spaces (letting you get to anywhere once). After that, you need to apportion a food counter in order to move again, and until you buy a wheelbarrow, you can only move one extra space. So now you have to mentally juggle the optimal combination of resources you’ve plucked at random from your bag, which is hard enough, with the fact that you probably don’t have enough juice to get to all the areas you want to reach. It might sound simple, but in practice it adds a ton of analysis to every turn. It flips a breezy experience into something much more complex. Similarly, the storehouse mechanic, while fun, has a whole minigame involving collecting ears of magic corn that you can use as wild tokens to complete rows of saved goods. Without going into it too much, to make the most of these scarce corns, you have to plan when you stash things three or four turns in advance so you don’t accidentally hamstring yourself with an easy-to-make blocking move. This complexity isn’t necessarily bad—if that’s your bag, you’ll probably love this—but Altiplano definitely should be reserved for those with some gaming experience under their belt. It can also end up feeling quite solitary. Even though it scales to five people, there aren’t many meaningful player interactions. You’re competing to buy the best new action spaces or unique cards for contracts/huts/canoes, and toward the end, you’re fighting for suddenly dwindling supplies of fish or stone as people load up their storehouses, but there’s otherwise little crossover. For the larger part of the game, there is a surfeit of resources, which limits the scope for interesting tactical blocking moves. This lack of conflict is quite common in Euro-style board games, but for whatever reason the isolation feels more pronounced in Altiplano. Again, alongside its better focus, Orléans had more meaningful conflict and interaction—mostly because resources are so much scarcer. Altiplano is a good game for those who can get it to the table often enough that each player knows its systems well. There’s plenty of satisfaction to be had after min-maxing your way to a really profitable turn, and games between equals who know what they’re doing always end up agreeably close. 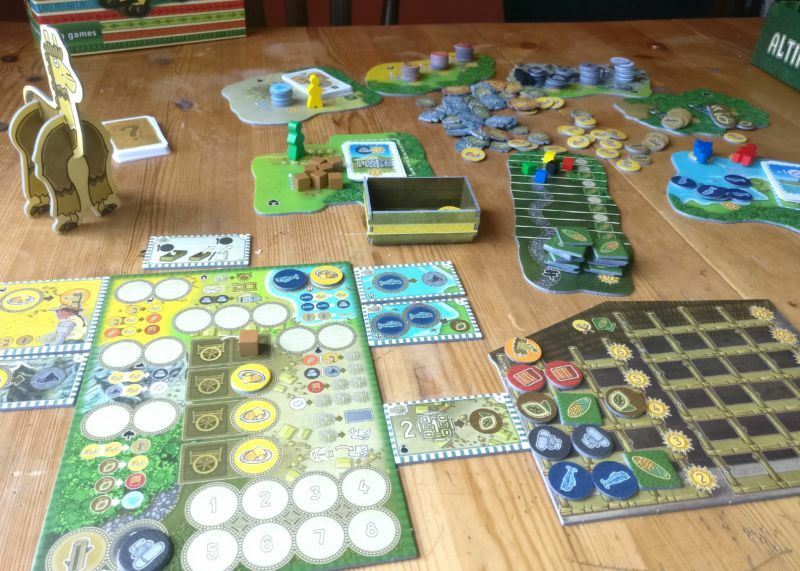 Much of this review has been spent comparing Altiplano with its ancestor. In truth, you won’t need both games in your collection unless you’re a total bag-building completionist. There’s a lot to recommend in both: Orléans is tighter but so light on theme as to feel impersonal, while Altiplano has enough charm to carry it through its flabbier moments, and its bag-building core still feels unique. Finally, Altiplano isn’t expensive considering the sheer quantity of cardboard involved. Bottom line: don’t let the grinning llamas (alpacas?) fool you; this can be a powerful gaming experience… but only for a certain kind of player. You are reading an article on the Altiplano review: A brain-tickling board game about… alpacas. All materials on the site Gadgets F, а также и статья Altiplano review: A brain-tickling board game about… alpacas - written for the purpose of information enrichment and we are happy if you like our magazine. Making The Grade: Could Apple own IoT in the enterprise with HomeKit for Work?